Three Chinese astronauts manually docked their space capsule at an orbiting module Sunday (June 24), a major first for China's space program and the country's plans to build a large space station. The astronauts docked their Shenzhou 9 spacecraft with the unmanned Tiangong 1 module 213 miles (343 kilometers) above Earth. It was the second orbital linkup in a week for the two spacecraft, which performed China's first automated space docking June 18. Shenzhou 9's astronauts Liu Wang, Jing Haipeng and Liu Yang — who is China's first female astronaut — are the fourth Chinese crew to fly in space. The astronauts launched into orbit on June 16, atop a Long March 2F rocket from the Jiuquan Satellite Launch Center in China's northern Gansu province. 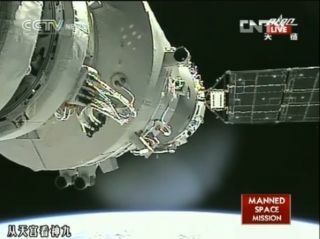 Earlier today, the astronauts undocked the two spacecraft and flew Shenzhou 9 about 1,300 feet (400 meters) away. They then maneuvered their capsule by hand, with Liu Wang at the helm, back into docking configuration with Tiangong 1 at 12:48 p.m. China Standard Time, or 12:48 a.m. EDT (0448 GMT). "The success of the manual rendezvous and docking mission represents another important phase achievement of the Shenzhou 9 and Tiangong 1 rendezvous and docking mission," Wu Ping, spokeswoman of the China Manned Space Program, said during a press briefing following the docking. "The three astronauts will once again enter the orbiting module of Tiangong 1 to carry out scientific experiments." The mission's docking maneuvers are a milestone in the development of China's manned space program, which flew its first astronaut in space in 2003. Tiangong 1 (which means "Heavenly Palace" in Chinese) is a prototype for China's first manned space station, which officials say will be functional by 2020. China is the third country after Russia and the United States to fly astronauts into space. After today's docking, the Shenzhou 9 astronauts (known as taikonauts) received a message from a group of Chinese oceanauts who are setting records not above the ground but below it. "We wish for a great success of the manual docking and brilliant achievements in China's manned space and manned deep-sea dive causes," read a message sent by three crewmembers aboard the Chinese submersible Jiaolong, 7,015 meters (23,000 feet) beneath the Pacific Ocean in the Mariana Trench, the deepest spot on Earth, state-run newspaper Xinhua reported. The oceanaut crew set a new deep-diving record for China on June 22. Shenzhou 9 and Tiangong 1 are due to stay connected for four more days, with the crew departing June 28 and landing back on Earth June 29.